The Continental Congress was a convention of delegates called together from the Thirteen Colonies that became the governing body of the United States during the American Revolution. The Congress met from 1774 to 1789 in three incarnations. The first call for a convention was made over issues of the blockade and the paper money. The Patrick Henry and John Adams were elected by their respective colonial assemblies. Other notable delegates included Samuel Adams from Massachusetts Bay, and Joseph Galloway and John Dickinson from Pennsylvania. Peyton Randolph of Virginia was its president. economic boycott of Great Britain in protest and petitioned the King for a redress of grievances. The colonies were united in their effort to demonstrate their authority to Great Britain by virtue of their common causes and through their unity, but their ultimate objectives were not consistent. Pennsylvania and New York had sent delegates with firm instructions to pursue a resolution with Great Britain. While the other colonies all held the idea of colonial rights as paramount, they were split between those who sought legislative equality with Britain and those who instead favored independence and a break from the Crown and its excesses. On October 26, 1774 the First Continental Congress adjourned but agreed to reconvene in May 1775 if Parliament still did not address their grievances. The Second Continental Congress convened on May 10, 1775 at Philadelphia’s State House, unanimously passing the Declaration of Independence on July 4, 1776. Thomas Jefferson of Virginia drafted the declaration and John Adams was a leader in the debates in favor of its adoption. John Hancock of Massachusetts was the president during those debates. To govern during the American Revolution, the Second Continental Congress continued, meeting at various locations, until it became Congress of the Confederation when the Articles of Confederation were ratified on March 1, 1781. The passage of the Northwest Ordinance in 1787. This ordinance accepted the abolishment of all claims to the land west of Pennsylvania and north of the Ohio River by the states of Pennsylvania, Virginia, New York, Connecticut, and Massachusetts, and the ordinance established Federal control over all of this land in the Northwest Territory—with the goal that several new states should be created there. In the course of time, this land was divided among Ohio, Michigan, Indiana, Illinois, Wisconsin, and part of Minnesota. Robert Morris, the Minister of Finance, persuaded Congress set up the Bank of North America, in 1782. This bank was privately chartered, but it was funded in part by the loan from France. The Bank of North America played a major role in financing the war against the United Kingdom of Great Britain and Ireland. The combined armies of Nathanael Greene, with the help of the French Army and Navy, defeated the British in the Battle of Yorktown during October 1781. Lord Cornwallis was forced to sue for peace and to surrender his entire army to General Washington. During 1783, the Americans secured the official recognition of the independence of the United States from the United Kingdom via negotiations with British diplomats in Paris, France. These negotiations culminated with the signing of the Treaty of Paris of 1783, and this treaty was soon ratified by the British Parliament. The delegates to the Continental Congress had extensive experience in deliberative bodies before coming to Congress, with “a cumulative total of nearly 500 years of experience in their colonial legislatures, and fully a dozen of them had served as Speakers of the houses of their legislatures.” Both the Stamp Act Congress. Nine of the 56 delegates who attended the First Congress in 1774 had previously attended the Stamp Act Congress in 1765. These were some of the most respected of the delegates, and they influenced the direction of the organization from its opening day, when decisions were made on organization and procedures that lasted over fourteen years until the Congress was adjourned on March 2, 1768. The delegates chose a presiding President of the Continental Congress to monitor the debate, maintain order, and make sure journals were kept and documents and letters were published and delivered. Otherwise, the President had little power, and he was largely a figurehead used to meet visiting dignitaries: the office was “more honorable than powerful”. The job was not much sought after or retained for long: there were 16 Presidents in 14 years. The turnover of delegates was enormously high as well, with an average year-to-year churn rate of 37% by one calculation, and 39% by session-to-session. Of the 343 serving delegates, only 55% (187 delegates) spent 12 or more months in Philadelphia at the Congress. Only 25 of the delegates served longer than 35 months. This high rate of turnover or churn was not just a characteristic; it was made into a deliberate policy of term limits. In the Confederation phase of the Congress “no delegate was permitted to serve more than three years in any six”. Attendance was variable: while in session, between 54 and 22 delegates were in attendance at any one time, with an average of only 35.5 members attending between 1774 and 1788. Between 1775 and 1781 they created a few standing committees to handle war related activities, such as the committee of secret correspondence, the treasury board, the board of war and ordnance, and the navy board. However, most of their work was done in small “ad hoc” committees consisting of members nominated from the floor. The delegate with the most votes became the chair of the committee. Committees typically had 3 to 5 members: roughly 77% of the committees had only 3 members. They created 3,294 committees over the 14.5 year calendar life of the congress – nearly 19 committees a month. At the opening of the Congress, when one delegate suggested they appoint a committee on rules and voting, the motion was rejected, as “every Gent. was acquainted” with the British House of Commons usage, and such a committee would be a “waste of time.” They did write up rules of debate that guaranteed equal rights to debate and open access to the floor for each delegate. Voting was by the “unit rule”: each state cast a single vote. Votes were first taken within each state delegation. The majority determined vote was considered the vote of the state on a motion: in cases of a tie the vote for the state was not counted. The Continental Congress took on powers normally held by the British monarch and his council, such as the conduct of foreign and military affairs. However, the right to tax and regulate trade was reserved for the states, not the Congress. They had no formal way to enforce their motions on the state governments. Delegates did not report directly to the President, but to their home state assemblies: its organizational structure has been described as “an extreme form of matrix management. It ran with very low overhead of 4 men for the 56 delegates, having only Secretary Charles Thomson as its operating officer, supported by a scribe, a doorman, and a messenger. They also appointed initially one, and later two, Congressional Chaplains. 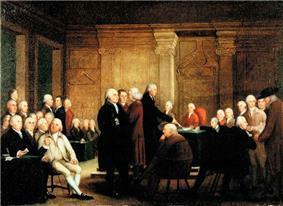 Many commentators take for granted that the leaderless, weak, slow, and small-committee driven, Continental Congress was a failure, largely because after the end of the war the Articles of Confederation no longer suited the needs of a peacetime nation, and the Congress itself, following Madison’s recommendations, called for its revision and replacement. Some also suggest that the Congress was inhibited by the formation of contentious partisan alignments based on regional differences. Others claim that Congress was less ideological than event driven. Others note that the Congress was successful in that the American people “came to accept Congress as their legitimate institution of Government”, but the “rather poor governmental record”  of the Congress forced the constitutional convention of 1787. The Historian Richard P. McCormick rendered a more nuanced judgment. He suggested that Madison’s “extreme judgment” on the Congress was “motivated no doubt by Madison’s overriding desire to create a new central government that would be empowered veto the acts of state legislatures,” but that it fails “to take any notice of the fact that while the authority of the Confederation Congress was ambiguous, it was not a nullity”. Documents from the Continental Congress and the Constitutional Convention From the Collections at the Library of Congress. Henderson, H. James (1974). Party Politics in the Continental Congress. New York: McGraw-Hill. Rakove, Jack N. (1979). The Beginnings of National Politics: An Interpretive History of the Continental Congress. New York: Knopf. ^ Rakove, Jack N. (1979). The Beginnings of National Politics: An Interpretive History of the Continental Congress. pp. 42–62. ^ a b "Confederation Congress". Ohio Historical Society. Retrieved October 23, 2010. ^ Taylor, Hannis. The Origin and Growth of the American Constitution, page 268 (1911). ^ Burnett, Continental Congress, 726.